Just squeeze the pouch and deliver the fluid. 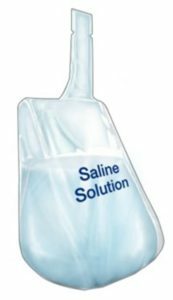 The new Stand Up SqueezyStraw™ Dispensing Pouch provides an excellent low-cost packaging alternative for health care applications. Prefilled Stand Up SqueezyStraw™ Dispensing Pouches for saline solution, sterile water (hot-fill) and other supply and therapeutic products can help drive better care at lower costs. 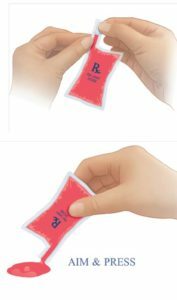 Stand Up SqueezyStraw™ Dispensing Pouch is made entirely from low-cost, light-weight flexible packaging materials and can be produced in many sizes. A 12-oz. size would cost approximately 6¢ each for packaging materials and royalties, in large volumes (50 million / year). Stand Up SqueezyStraw™ Dispensing Pouch can be made in any shape or size, and the squeeze feature allows for maximum evacuation, including single unit dose packs for Rx meds.